오벨리스크 앞에 위치한 Park Silver Obelisco는 부에노스아이레스의 문화-금융 지구에 편리하게 자리해 있으며, 콜론 극장에서 200m 떨어져 있습니다. 이 호텔은 각종 레스토랑과 오락 시설이 밀집한 갈레리아스 파시피코 쇼핑센터, 플로리다 보행자 거리, 코리엔테스 거리에서 도보 거리에 있습니다. Park Silver Obelisco는 첨단 기술 시설과 우아한 인테리어를 자랑하며, 도시의 주요 랜드마크 중 하나인 오벨리스크의 장엄한 전망을 제공합니다. 이 호텔에서 피트니스 센터와 회의 시설도 이용하실 수 있습니다. Park Silver Obelisco의 각 객실은 전용 욕실, LCD 케이블 TV, 디지털 안전 금고, 미니바와 에어컨을 갖추고 있습니다. Park Silver는 푸에르토 마데로에서 1.5km, 라 레콜레타 공동묘지와 국립 미술관에서 4km 떨어져 있습니다. 유럽식 조식 뷔페는 매일 07:00~10:30에 제공됩니다. 객실 5개 이상의 단체 예약 시 총 숙박 요금의 50%에 해당하는 금액을 체크인 30일 전까지 선결제하셔야 합니다. 현지 세법에 따라 모든 아르헨티나 국민과 외국인 거주자는 21%의 부가세(VAT)를 추가로 지불하셔야 합니다. 해외 신용카드, 직불카드, 은행 송금으로 결제하는 외국인에 한해 숙박 및 조식에 부과되는 21%의 부가세(VAT)가 면제되며, 이 경우 외국 여권 또는 외국 신분증과 이민국에서 발급한 관련 서류를 제출하셔야 합니다. Downtown location, near metro station, many restaurant nearby. Is a small room hotel locate in down town. Hi speed wifi and nice staff. One way subway only 5 peso. 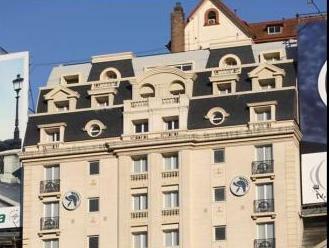 The hotel location is very convenient in front of the Obelisco and walking distance to downtown Buenos Aires, the Casa Rosada and even to Puerto Madero. Aditionally the metro station is right outside the hotel. The hotel is very well decorated contemporary european style, however rooms are small and bathrooms too. Do not expect the type of hotel room sizes as in the US or some other Latinamerican countries. Breakfast was dull and avoid it since you can find nice places for brakefast everywhere around the hotel. The best hotel in the city center for the price. Don´t use the Phone Internationally is super over price. The best hotel in the city center for the price. Don´t use the Phone Internationally is super over price. But is a real offer. Remember to label your bags inside and out. Located far from normal development on the Coast of Argentina.